Background/Objective: Secukinumab is an effective treatment for psoriasis, and it has been reported to be effective in patients who failed on multiple prior biologics. However, treatment failure of secukinumab is possible and the alternative management in these patients remains poorly studied. Methods: We reviewed the treatment efficacy of all patients with moderate-to-severe psoriasis who used secukinumab as monotherapy and did not reach Psoriasis Area Severity Index 75 (PASI 75) response at week 16 (primary failure) or later (secondary failure). The treatment response of these patients during subsequent treatments was recorded. Optimal PASI improvement between weeks 12 and 20 and at the end of observation period was recorded. Results: Traditional systemic treatment (n = 4), etanercept (n = 1), adalimumab (n = 6), secukinumab weekly reloading (n = 2), or ustekinumab (n = 4) was administered in 16 patients (one with both ustekinumab and adalimumab). 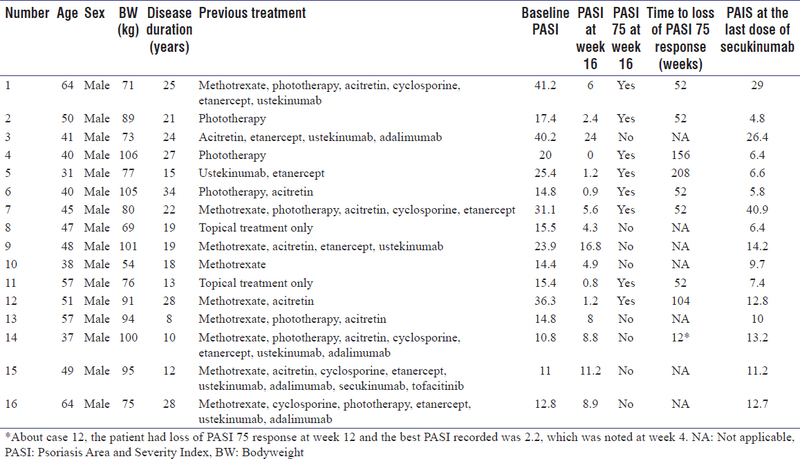 Six patients reached PASI 75 at week 16, including three (50%) with adalimumab. PASI 75 response was maintained in four patients at the end of observation period. Two (50%) of them used adalimumab, one used methotrexate plus acitretin, and the other used secukinumab. Conclusion: Adalimumab demonstrates better response in patients with refractory psoriasis to secukinumab. Traditional systemic medication and re-loading of secukinumab can also provide some benefits. The treatment of patients with psoriasis has evolved over the decade, and currently biologics have become the first-line treatments in patients who are candidates for systemic treatment due to their favorable efficacy and safety. Improvement in 75% of Psoriasis Area Severity Index (PASI 75) had been the primary treatment target of psoriasis; however, the bar has been raised to PASI 90 since the advent of secukinumab, an interleukin-17 (IL-17) blocker, which has been approved for more than 3 years for psoriasis treatment. Secukinumab has also been reported to be effective in patients who had failed on multiple prior biologics,,, and sustained efficacy was reported up to 5 years. However, primary or secondary failure of secukinumab is not uncommon, and the treatment choice in these inadequate responders remains poorly studied. Here, we aim to report our experience in treating patients who had failed on prior secukinumab treatment. This is a retrospective observational study. We review the treatment efficacy of all patients who used secukinumab as monotherapy for moderate-to-severe plaque psoriasis (defined as at least baseline PASI = 12 and body surface area = 10%) in our clinic. All patients who received secukinumab alone for more than 6 months but had inadequate response were included, defined as failure to reach or maintain PASI 75 response after week 16 compared to baseline. The primary failure is defined as failure to reach PASI 75 after applying the biologics, whereas the secondary failure is defined as failure to maintain PASI 75 after treatment. Subsequent treatment response was recorded for those who were treated with systemic modalities for at least 16 weeks. PASI response was assessed by the same physician when the patients came back to our clinic. Due to variable time to optimal responses of the systemic treatment, we recorded PASI improvement between weeks 12 and 20 and also at the end of observation period. We included 16 male patients in the study, among whom 7 patients never reached PASI 75, and the others had secondary loss of efficacy. Most of them (6/9) had secondary failure to secukinumab in 1 year. Seven of the 16 patients maintained PASI 50 at the end of the treatment, but they were not satisfied with the treatment effect. All of them got deteriorated after cessation of the biologics. The patient demographics and characteristics are listed in [Table 1]. All of the patients received regular follow-up at our outpatient clinic after secukinumab failure. Traditional systemic treatment (i.e., methotrexate, acitretin, cyclosporine, or phototherapy), etanercept, adalimumab, secukinumab weekly reloading, or ustekinumab was administered. The therapeutic responses are listed in [Table 2]. 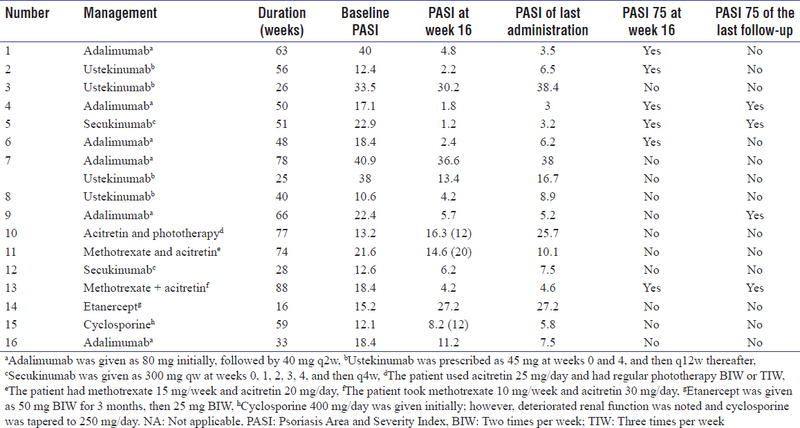 Only six patients reached PASI 75 at week 16, including three with adalimumab, one with traditional systemic treatment, one with secukinumab, and one with ustekinumab [Figure 1]a. At the end of follow-up, PASI 75 response was maintained in only four patients. Two of them used adalimumab, one used methotrexate plus acitretin, and the other used secukinumab [Table 2]. We also divided the nonresponders into primary and secondary failures. For those with primary failure to secukinumab [Figure 1]b, one patient (case 9) with adalimumab and the other one (case 13) with methotrexate plus acitretin revealed optimal improvement at follow-up after 1 year. For secondary nonresponders to secukinumab, more patients on adalimumab demonstrated PASI 75 response than those on other biologics: three of four patients with adalimumab at week 16, one of two with secukinumab, and one of two with ustekinumab [Figure 1]c. None of the patients who used nonbiologic systemic treatment reached PASI 75 in this group. The treatment of moderate-to-severe psoriasis had evolved significantly since the introduction of biologics. Newer biologics have been approved as the first-line treatment for patients who are candidates for systemic treatment due to their favorable efficacy and safety. Despite their high efficacy, there are still some patients who have limited therapeutic response, presenting either as primary or secondary failure. Some studies about the efficacy of switching biologics such as adalimumab after etanercept, etanercept, or ustekinumab, after adalimumab/infliximab, and secukinumab after ustekinumab exist. Moreover for secukinumab failure, there is one recent article which showed ixekizumab, a novel IL-17 inhibitor, to be effective. Secukinumab is the first approved IL-17 inhibitor for psoriasis treatment. In the FIXTURE study, PASI 75 was achieved by 77.1% with 300 mg of secukinumab and 67.0% with 150 mg of secukinumab at week 12. In CLEAR study, the peak response occurred at week 16 when PASI 90 response was achieved by 79.0% with 300 mg secukinumab and 57.6% with ustekinumab. Secukinumab showed sustained therapeutic effects in pivotal clinical studies; however, the therapeutic effect seemed to decrease gradually in the real world., The treatment efficacy for those who failed prior secukinumab has not been well studied. In one study, ixekizumab was reported to be highly effective in patients who failed on primary secukinumab. At least PASI 75 response or Physician Global Assessment 0/1 was achieved in 4/4 of primary nonresponders and in 8/9 of secondary nonresponders after the use of ixekizumab. However, the exact baseline and posttreatment PASI were not provided. In the other study, over a 2-year time horizon, the treatment sequence of secukinumab-adalimumab-ustekinumab offered the lowest cost per PASI 90 responder. If the patient had used all the currently available biologics, the biologics which produced the best response (at least PASI 50 response) would be re-applied (cases 3, 7, 14, and 16). Among the treatments, adalimumab seems to demonstrate better response compared to the other biologics or secukinumab reloading. In addition, traditional therapy has resulted in at least PASI 50 response in 75% (3/4) of the patients, including PASI 75 in one patient at the last administration [Table 3]. Patients who had secondary failure seem to respond to the switched treatment better than those with primary failure. Compared to switching to ixekizumab, the treatment response in our study is less impressive. However, because of difference in inclusion criteria and prior treatment, it is not known if ixekizumab will be a preferred choice compared to other biologics for those who failed on prior secukinumab since both ixekizumab and secukinumab share similar mode of action as IL-17 blockers. In this study, we reported our treatment experience in patients with refractory psoriasis to secukinumab. Adalimumab seems to work slightly better than ustekinumab, possibly due to different modes of action. However, traditional systemic medication and re-loading of secukinumab can also provide some benefits. However, both our and prior studies were limited by small case number, heterogeneous prior treatments, and relative short follow-up period after switching into new treatment. To provide stronger evidence-based recommendations, controlled studies to re-randomize more patients who fail on secukinumab into different treatment groups of biologics, such as adalimumab, ustekinumab, guselkumab, or ixekizumab, will be needed. This work was supported by a grant from the National Taiwan University Hospital (201605118RINB). The funders had no role in study design, data collection and analysis, decision to publish, or preparation of the manuscript. Magnano M, Loi C, Patrizi A, Sgubbi P, Balestri R, Rech G, et al. Secukinumab in multi-failure psoriatic patients: The last hope? J Dermatolog Treat 2018;29:583-5. Wang TS, Chan CC, Chiu HY, Tsai TF. Secukinumab in psoriasis patients with prior ustekinumab treatment: Results of a single-center experience. Dermatol Sin 2017;35:25-9. Morgado-Carrasco D, Riera-Monroig J, Fustà-Novell X, Alsina Gibert M. Response to secukinumab after treatment failure with ustekinumab in 6 patients with plaque psoriasis. Actas Dermosifiliogr 2018;109:565-7. Bissonnette R, Luger T, Thaçi D, Toth D, Lacombe A, Xia S, et al. Secukinumab demonstrates high sustained efficacy and a favourable safety profile in patients with moderate-to-severe psoriasis through 5 years of treatment (SCULPTURE extension study). J Eur Acad Dermatol Venereol 2018;32:1507-14. Weng HJ, Wang TS, Tsai TF. Clinical experience of secukinumab in the treatment of erythrodermic psoriasis: A case series. Br J Dermatol 2018;178:1439-40. Bissonnette R, Bolduc C, Poulin Y, Guenther L, Lynde CW, Maari C, et al. Efficacy and safety of adalimumab in patients with plaque psoriasis who have shown an unsatisfactory response to etanercept. J Am Acad Dermatol 2010;63:228-34. Bissonnette R, Maari C, Barber K, Lynde CW, Vender R. Etanercept for patients with psoriasis who did not respond or who lost their response to adalimumab or infliximab. J Eur Acad Dermatol Venereol 2015;29:1576-81. Wang TC, Chiu HY, Wang TS, Tsai TF. Practical experience of ustekinumab in patients with moderate-to-severe psoriasis who had inadequate therapeutic response to prior tumor necrosis factor blockers. Dermatol Sin 2015;33:5-10. 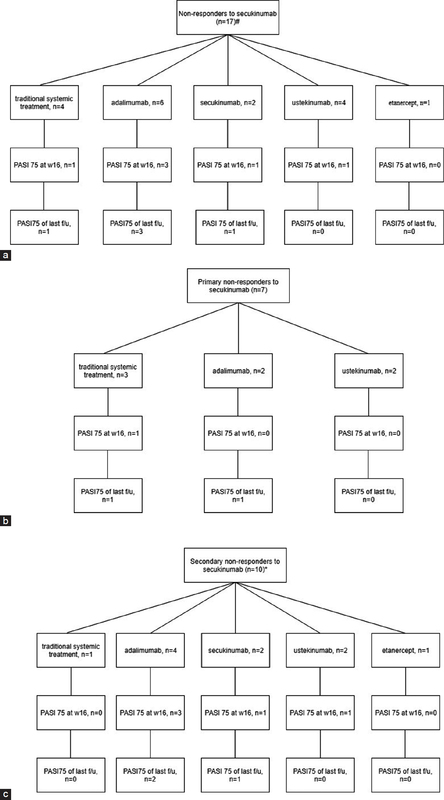 Georgakopoulos JR, Phung M, Ighani A, Yeung J. Efficacy and safety of switching to ixekizumab in secukinumab nonresponders with plaque psoriasis: A multicenter retrospective study of interleukin 17A antagonist therapies. J Am Acad Dermatol 2018;79:155-7. Langley RG, Elewski BE, Lebwohl M, Reich K, Griffiths CE, Papp K, et al. Secukinumab in plaque psoriasis – Results of two phase 3 trials. N Engl J Med 2014;371:326-38.
van den Reek JM, van Vugt LJ, van Doorn MB, van der Kraaij GE, de Kort WJ, Lucker GP, et al. Initial results of secukinumab drug survival in patients with psoriasis: A multicentre daily practice cohort study. Acta Derm Venereol 2018;98:648-54. Georgakopoulos JR, Ighani A, Phung M, Yeung J. Drug survival of secukinumab in real-world plaque psoriasis patients: A 52-week, multicenter, retrospective study. J Am Acad Dermatol 2018;78:1019-20. Chernyshov PV, Tomas-Aragones L, Manolache L, Svensson A, Marron SE, Evers AWM, et al. Which acne treatment has the best influence on health-related quality of life? Literature review by the European academy of dermatology and venereology task force on quality of life and patient oriented outcomes. J Eur Acad Dermatol Venereol 2018;32:1410-9.